The city authorities have already prepared a preliminary list of locations for the music spots. Buskers will only be allowed to play in 15 places on the network as of 2016. 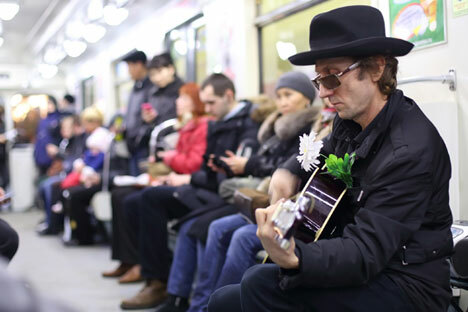 The Moscow municipal authorities have selected 15 spots on the Moscow Metro where street musicians will be allowed to perform after passing a special audition. "The authors of the initiative borrowed the idea from London, where only licensed buskers are allowed to perform on the London Underground. The dedicated locations will ensure better security for musicians themselves – they are well covered by CCTV cameras – and will allow the musicians to perform and people to enjoy their music without being in the way of the other passengers," says a statement released by the Moscow mayor's office. All the performances will be free, a message on the Moscow city government's official website explains. Notices that will be put up next to the dedicated spots will make it clear that donations can only be voluntary. The city authorities have already prepared a preliminary list of locations for the music spots: the stations Arbatskaya (on the light-blue line), Borovitskaya, Vorobyevy Gory, Vystavochnaya, Dostoyevskaya, Kitay-Gorod, Kurskaya, Lermontovsky Prospekt, Mayakovskaya, Polyanka, and Trubnaya. Buskers will also have designated spots in the connections from Trubnaya to Tsvetnoy Bulvar, from Teatralnaya to Okhotny Ryad, from Okhotny Ryad to Teatralnaya, and from Teatralnaya to Ploshchad Revolutsii. The project is planned to be launched in the first quarter of 2016.